Kyle Kerkenhoff's paper (p. 78) tabulates several ways that consumer credit laws have changed since 2007. Driverless vehicles would be a windfall for households and businesses that acquire them but would probably increase traffic and nationwide fuel usage. Google and other innovators are working on vehicles that someday might drive themselves with little or no attention from human passengers. The vehicles of the future will have fast, observant computers that automatically communicate position and road conditions with other vehicles on the road. Driverless vehicles are expected to help children, the blind, the elderly and others who currently cannot safely drive themselves. Helped by their huge amounts of data and computing power, driverless cars are also purported to reduce traffic congestion and nationwide fuel consumption by driving smarter. But smarter driving will lead to more driving, because smarter driving reduces the cost per mile of vehicle usage. The end result of additional driving could be more traffic and more aggregate fuel consumption. Fuel and wear and tear cost roughly 50 cents a mile, which is why employers reimburse employees for job-related personal vehicle usage at about that rate. At an average speed of 30 miles an hour (including stops, traffic conditions and so on), each mile takes two minutes of driver time. For those who value their time at more than $15 an hour, the time cost of the trip exceeds the combined fuel and wear and tear costs. Research has shown that cutting travel costs through reduced gas prices causes people to drive more, for example by eschewing carpools and public transportation. A driverless car should also cause people to use their vehicles for more miles, because they could use their time in the car to sleep, work, watch television, read a book and do other things they might normally do at home. Households and business may also begin to use vehicles with no human passengers or drivers in order to move goods from one place to another and, by economizing on the human driver costs, they may want to move more goods than they do today. As people take on additional activities in their personal vehicles, they may also demand larger vehicles that necessarily require more fuel per mile. Before driverless cars are adopted, a number of hurdles must be cleared. Some refinements in vehicle technology need to be resolved; insurance companies and state regulators must also figure out liability issues. Even if driverless vehicles led to more congestion and more aggregate fuel consumption, driverless vehicles would be a welcome technological advance, because the billions of hours that people already devote to driving could be put to alternative uses. But expect new driving technologies to increase the number of vehicles on the road. Although wealthy people are a small fraction of the population, their behavior is of great practical interest to Treasury officials. Every year, the United States Treasury receives extraordinary amounts of personal income tax revenue in April as individuals file their returns and reconcile the taxes they owe with the taxes that were withheld from their paychecks during the previous calendar year. Most people do not owe much, if anything, when they file their return but a small group of taxpayers has large balances to settle. 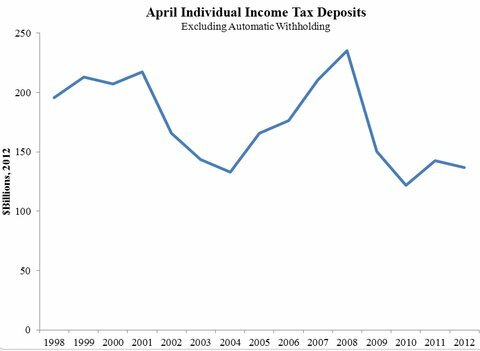 The chart below shows the inflation-adjusted amount of individual income tax receipts by the Treasury in April of each year since 1998, as reported by in the Daily Treasury Statement. The amount has fluctuated wildly, from a low of $122 billion to a high of $235 billion. The standard deviation of these April receipts is $36 billion. The general state of the economy in the calendar year helps to predict the amount the Treasury receives in following April. At the same time, additional fluctuations in April receipts derive from the situations and behaviors of a small segment of the population not well represented in the unemployment rate and other measures of the business cycle: the wealthy. First of all, taxes are withheld less often from asset income like dividends and capital gains than they are withheld from wages. The wealthy receive a larger share of their income from assets than from wages, not to mention that by definition the wealthy have more of both types of income. Second, much of the population does not owe any income tax – let alone owe extra in April – and the wealthy pay a disproportionate share of income taxes. The wealthy have become an even more important driver of tax revenues in recent history, as an increasing share of the nation’s income has accrued to them. Thomas Piketty and Emmanuel Saez have compiled decades of data for the United States (and other countries). They find, for example, that the very wealthiest of America’s households — the top one-tenth of 1 percent — recently received about one-thirteenth of the nation’s income, while they received only one-fiftieth in the 1960s and 1970s. The wealthy are sometimes idolized and other times envied, and for these reasons alone their behavior is of interest. But Treasury officials have another reason to stay abreast of the wealthy: their activities are an important determinant of the amount of revenue received by the Treasury, and when it is received. If you have special insights into how the wealthy behave, consider applying for a job at the Treasury. Employment can be a better indicator of labor market activity than unemployment, because unemployment is not the only way that a person can be without work. The blue series in the chart below shows the reduction in unemployment since March 2012, expressed as a percentage of the population (e.g., in a population of 100 million, 0.1 percentage points means 100,000 people and 0.5 percentage points means 500,000.) In order to correct for the movement of baby boomers into retirement, I used Bureau of Labor Statistics data only for people 25 to 54 years old (this group is about 124 million and has been falling a little). 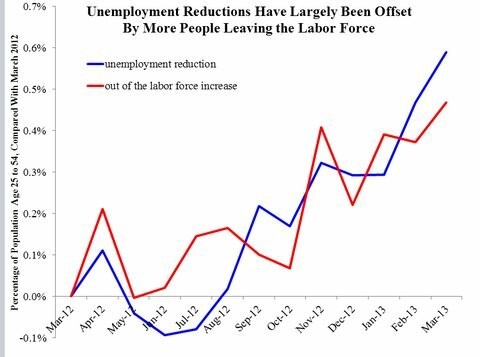 Over the subsequent year, and especially since mid-2012, unemployment was reduced significantly. But reduced unemployment is not the same as more employment, because the third labor force classification is “out of the labor force.” Neither the unemployed nor those out of the labor force have a job, but only the unemployed are actively looking for one. The red series in the chart shows that the “out of the labor force” ranks have increased roughly as much as unemployment has been reduced, and the difference between the blue and the red series indicates the change in the fraction of the population that is employed. For the months when the blue series is above the red series, employment per capita has increased since March 2012. Because the blue series hardly exceeds the red series, if at all, the large majority of the reduction in unemployment has been associated with offsetting increases in people out of the labor force. While the reduction in unemployment and the growth in the out of the labor force more or less cancel each other out, jobs are at least being created fast enough to absorb the growth in the working-age population. That additional population increases demand, which contributes to the jobs being created. Retirements and going to school could increase the number of people out of the labor force, but the data I’ve shown are for an age group in which retirement and schooling are rare. For the 25-to-54 age group, “out of the labor force” typically represents people who are finding ways to get by without working. Some people moving out of the labor force devote their time to caring for their young children while their spouses obtain cash income for the family. That some of the growth in those out of the labor force has occurred among married people suggests that such specialization in the family could be part of the story. But the fact that this group is growing especially among unmarried people suggests that family specialization explains at best a minority of the aggregate changes. Unemployment insurance benefits are paid only to people who report that they are actively looking for work. Some unemployed have long been skeptical that they can find a good job and are just going through the motions of job search to satisfy the unemployment program’s requirements (see this testimony to a House subcommittee by Stacey G. Reece, co-owner of a recruitment firm in Gainesville, Fla., who said he witnessed people “applying for jobs only to protect their status for unemployment insurance”). When such a person’s unemployment benefits run out, he may look less actively for work, which changes his classification from unemployed to out of the labor force. The termination of unemployment benefits can, and sometimes does, have the opposite effect, because the loss of income can make out-of-work people more seriously consider accepting a low-paying job. But unemployment insurance is by no means the only safety-net program. The Supplemental Nutrition Assistance Program (formerly known as food stamps) is a major and newly expanded safety-net program and does not require its beneficiaries to work or be looking for work. Curiously, SNAP has been expanding while the unemployment rate falls. People without jobs increasingly take part in the disability insurance program, which does not require people to look for work because “disability” means that the person is unable to work. Medicaid is another major safety program that does not require its participants to work. A significant part of the recent reductions in the unemployment rate may reflect movements of people between safety net programs rather than any significant change in their job-finding prospects. Small businesses have spoken out against the Affordable Care Act, but medium-size businesses, customers and taxpayers may be the ones ultimately harmed. Beginning next year, the Affordable Care Act will penalize employers that fail to offer health insurance to their employees. Because small employers are especially unlikely to offer health insurance (see Table 3 in this paper from the Congressional Budget Office), and large businesses are likely to avoid the penalties because they already offer insurance, the penalties seem like an attack on small business. But the Affordable Care Act simultaneously rewards employees at small companies by heavily subsidizing their purchases of health insurance on the exchanges created by the law. Because employees cannot take the subsidies with them if they switch to a large company offering health insurance, the subsidies are, in effect, subsidies to the small businesses themselves, helping them compete more cheaply in the market for employees. Employees at the smallest companies, with fewer than 50 employees, are eligible to receive the subsidies, even though their employers are exempt from the penalties. Indeed, some medium-size businesses that currently offer health insurance say they find the smaller company “penalty plus subsidy” combination attractive and plan to drop their health insurance plans in order to partake in it, too, even though their participation will entail a penalty. The Affordable Care Act also created tax credits for small business that are already available. These credits perhaps have too many strings attached to be attractive to employers, because only 770,000 employees (in an economy with more than 130 million) worked for employers claiming the credit in 2010 (see Page 9 of this report from the Government Accountability Office). The Affordable Care Act also promised to provide small-business employees a choice of health plans, but implementation of that plan has been pushed back until 2015. Many small businesses are not as good with bureaucracy and red tape as large businesses are – that’s one reason they did not offer health insurance in the first place. The employee subsidies coming online next year are pretty complicated, as evidenced by the 21-page application that must be completed by each employee, and the fact that any one year’s subsidy has to be estimated based on historical employee data, advanced from the Internal Revenue Service to the insurer, and then later reconciled when the employee’s family income for the year can be fully documented. I suspect that large businesses will have human resource personnel dedicated to helping company employees complete the application and obtain and accurately reconcile the subsidy to which they are entitled. Employees at smaller business may have to fend for themselves. We also have to remember that businesses compete for customers and for employees. A business that experiences a little direct harm from the act may benefit on the whole because competitors are harmed more. This is especially true because of the heavy penalty the law puts on businesses that expand from 49 to 50 employees: that one hire will cost the employer $40,000 annually in penalties, on top of that employee’s usual salary and benefits. Thus, the type of company that may benefit the most from the law is not necessarily large or small but a company with small competitors that have been looking for opportunities to expand their market share, and in the process bring the number of their employees to more than 49.